Start by melting 1 cup of chocolate chips using the melting instructions on the package. Remove from stove or microwave and pour warm chocolate into a bowl for dipping. Dip each marshmallow about half way down. Place chocolate side up on a sheet of parchment paper. 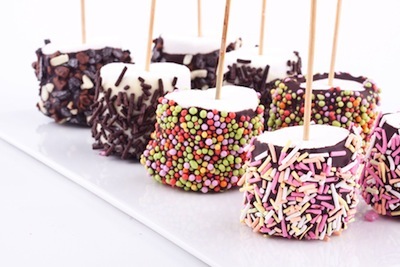 Sprinkle each with sprinkles while chocolate is still warm. Let dry about 5 minutes. Then, place each marshmallow into a cupcake wrapper.